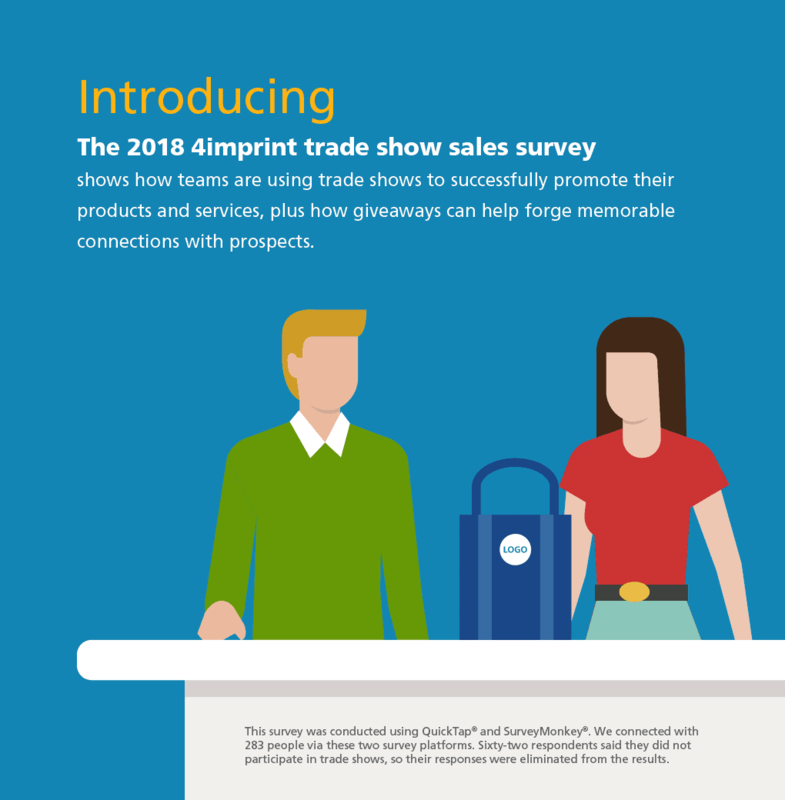 The 2018 4imprint trade show sales survey shows how teams are using trade shows to successfully promote their products and services, plus how giveaways can help forge memorable connections with prospects. 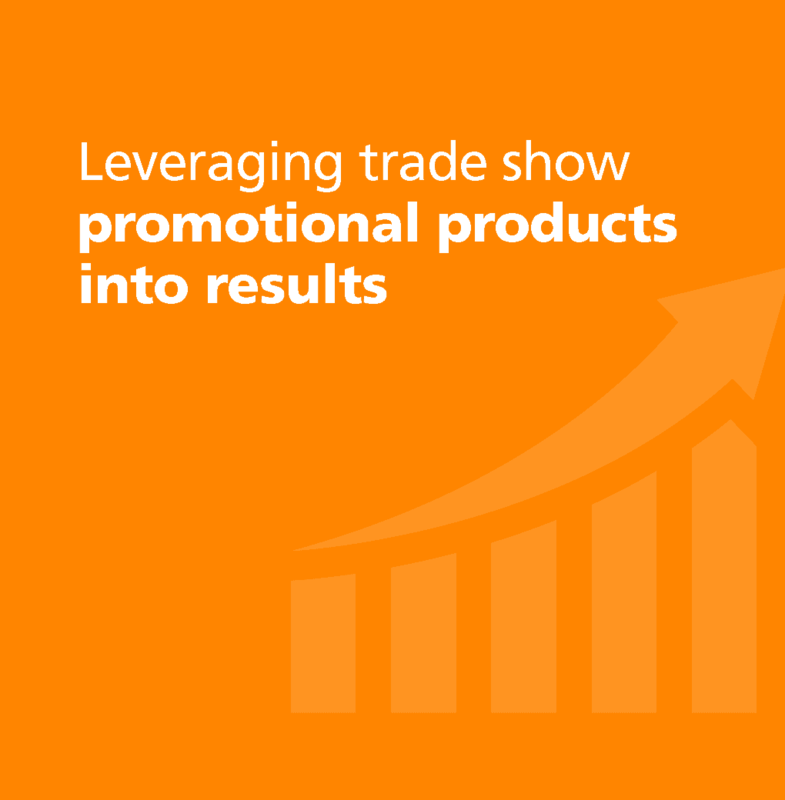 participate in trade shows, so their responses were eliminated from the results. Welcome to the results of our 2018 survey! 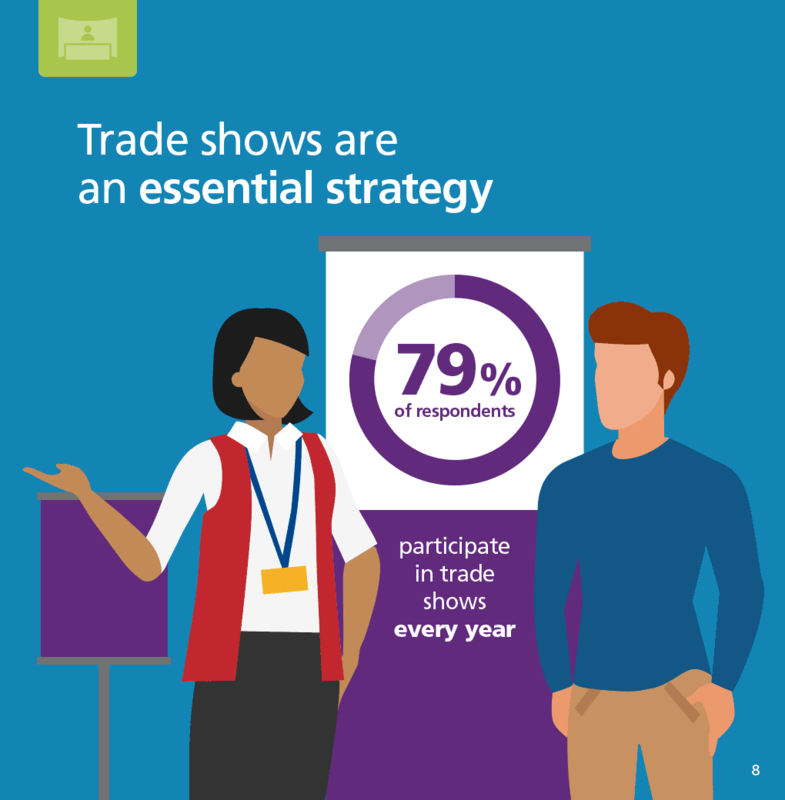 Trade shows are one of the best ways to bring people together. Every event is a chance to build a relationship. 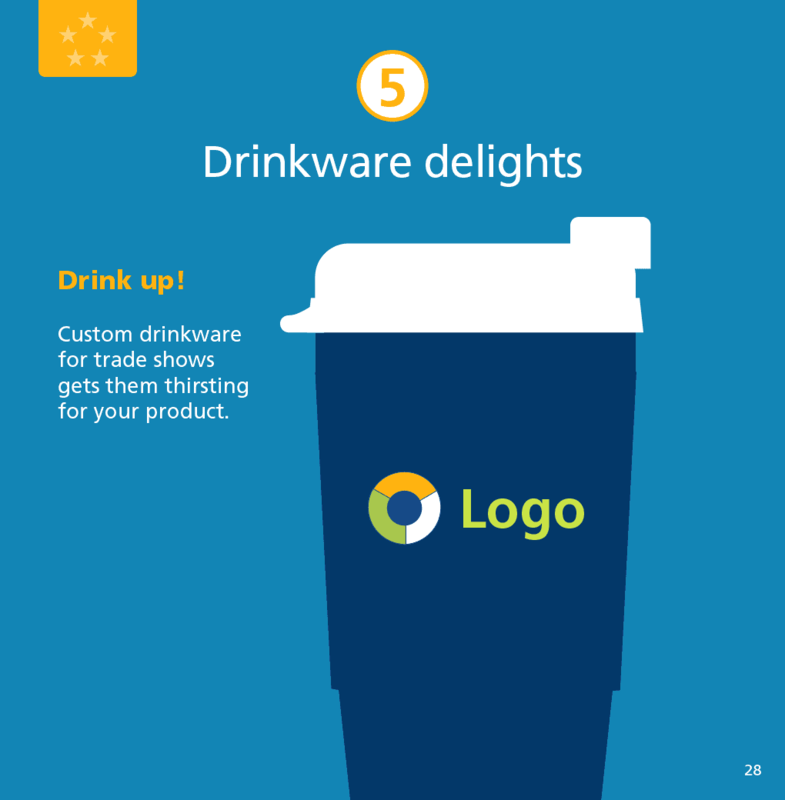 Every promotional product is a chance to start a conversation and get to know each other. But what is the best way to make those connections? And what do they hope to achieve when making those connections? 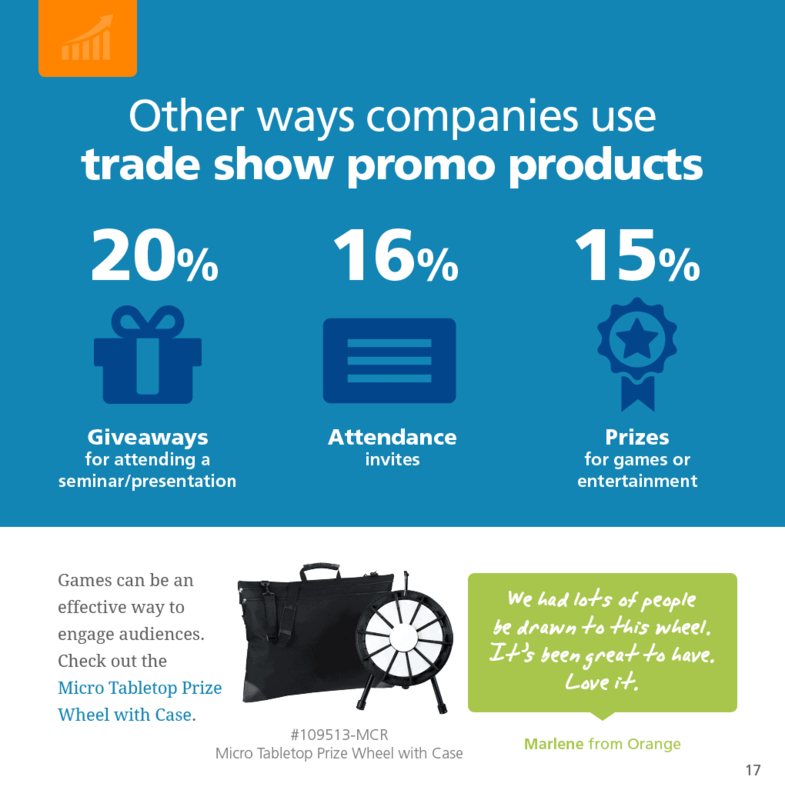 What role do promotional products play in those connections? We wanted to find out. 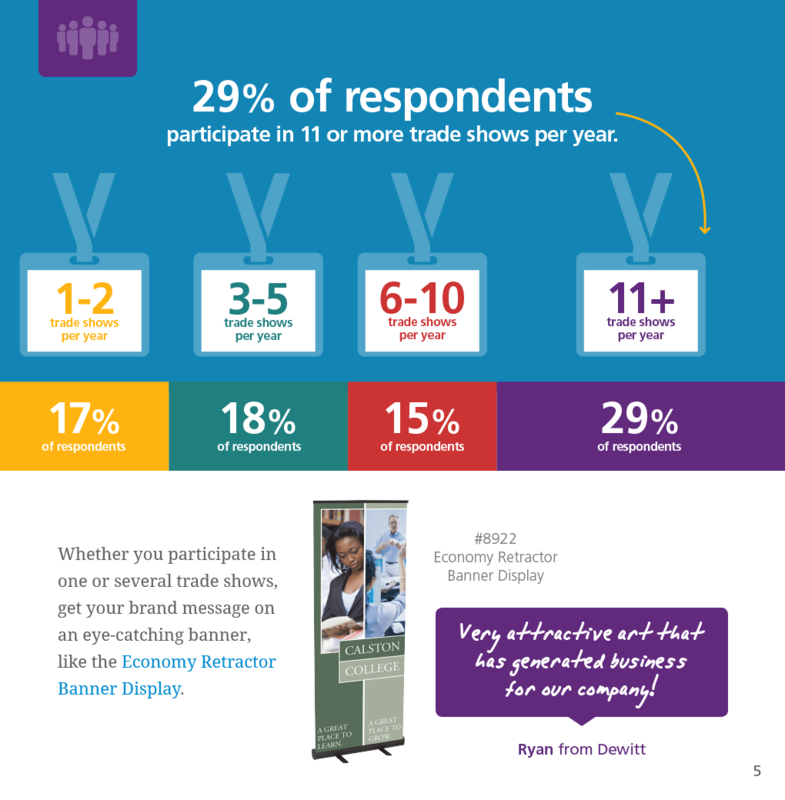 So, we conducted a survey to learn what the experts—folks on the trade show floors—had to say. And we discovered quite a lot! 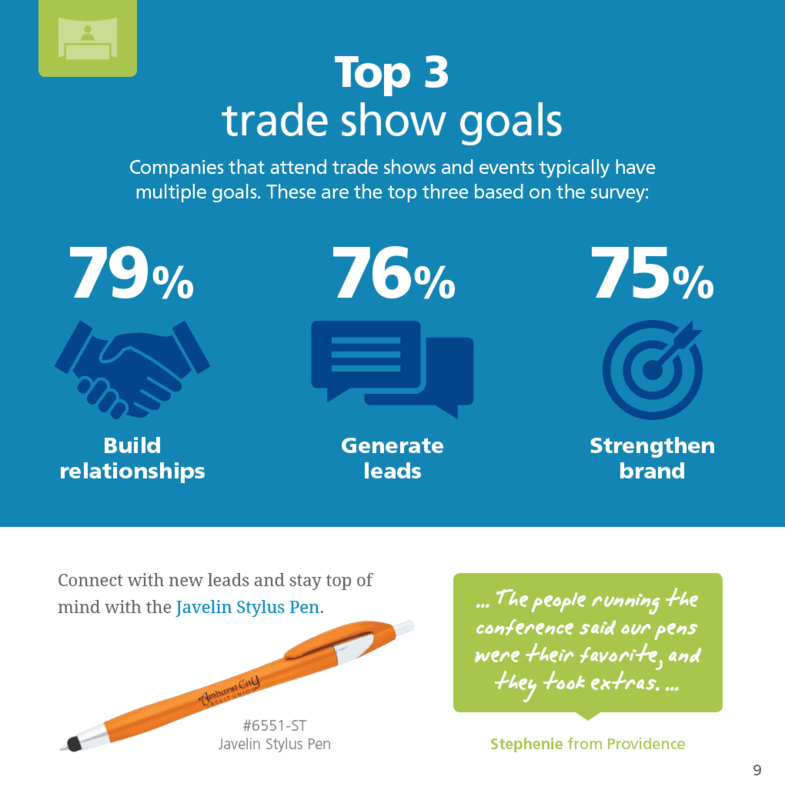 Among the things we learned: Almost four out of five respondents attend trade shows to build relationships. 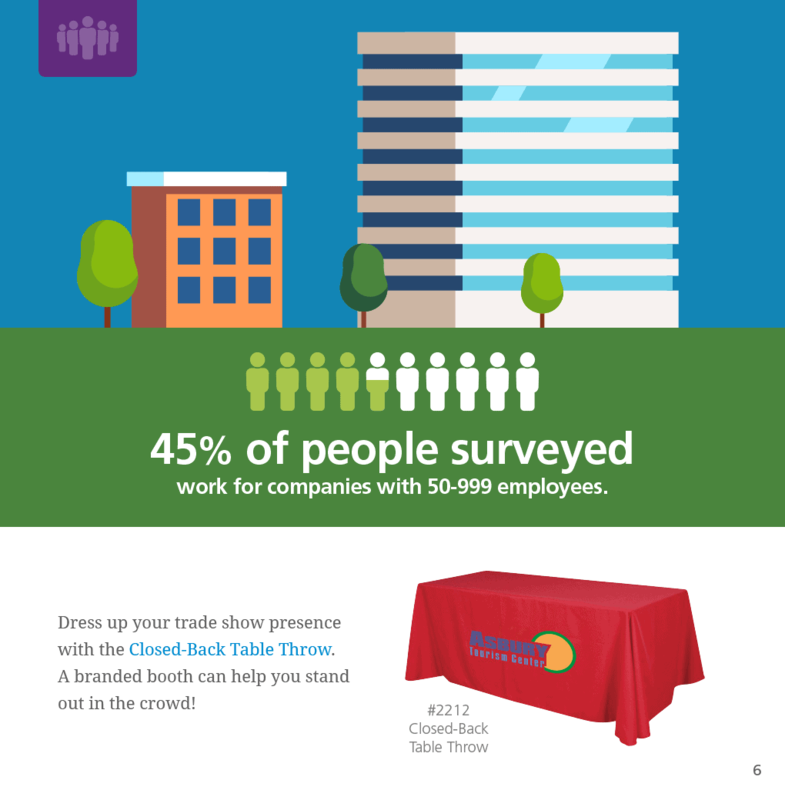 Most of them use promotional products to start a one-on-one conversation. 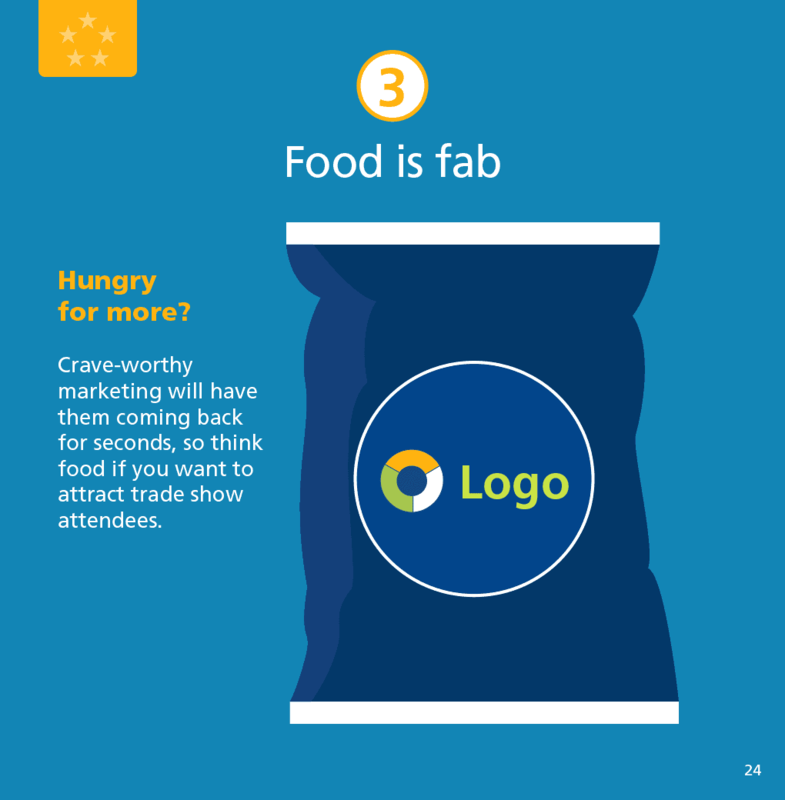 And one of the top five products used to start those conversations is food. All that information and more is contained in the pages of this eBook. 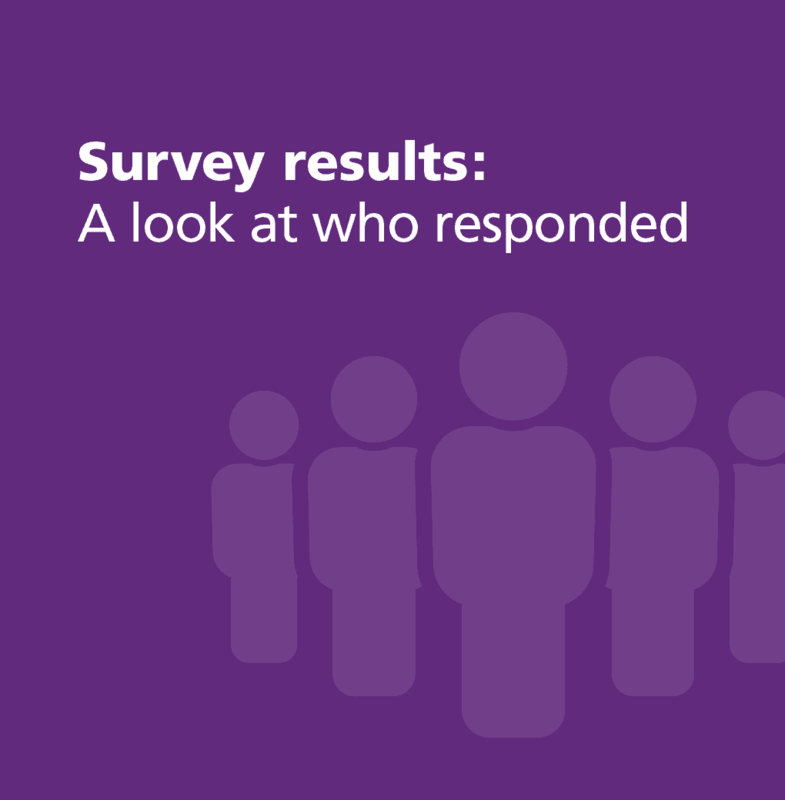 We learned a lot from this survey, and now we’re excited to pass this information along to you. 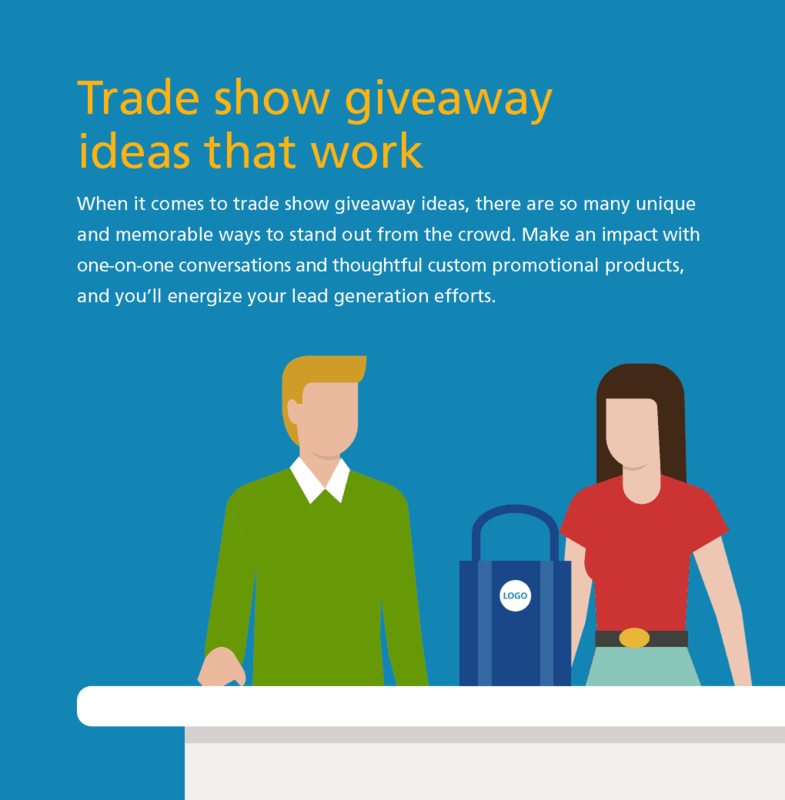 Hopefully, it helps you build more connections the next time you take to the trade show floor. 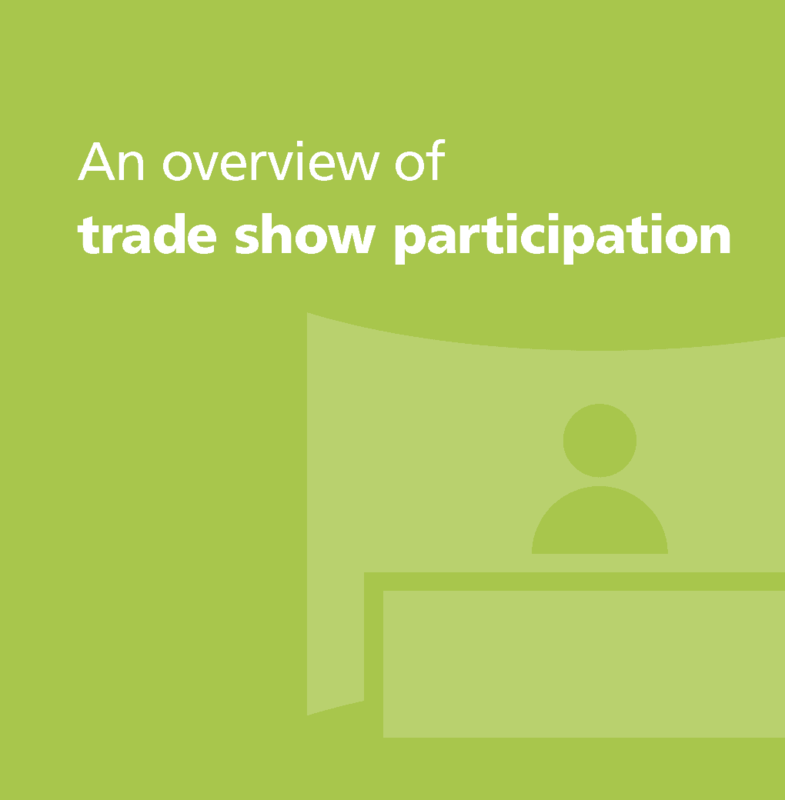 29% of respondents participate in 11 or more trade shows per year. like the Economy Retractor Banner Display. 45% of people surveyed work for companies with 50-999 employees. Connect with new leads and stay top of mind with the Javelin Stylus Pen. 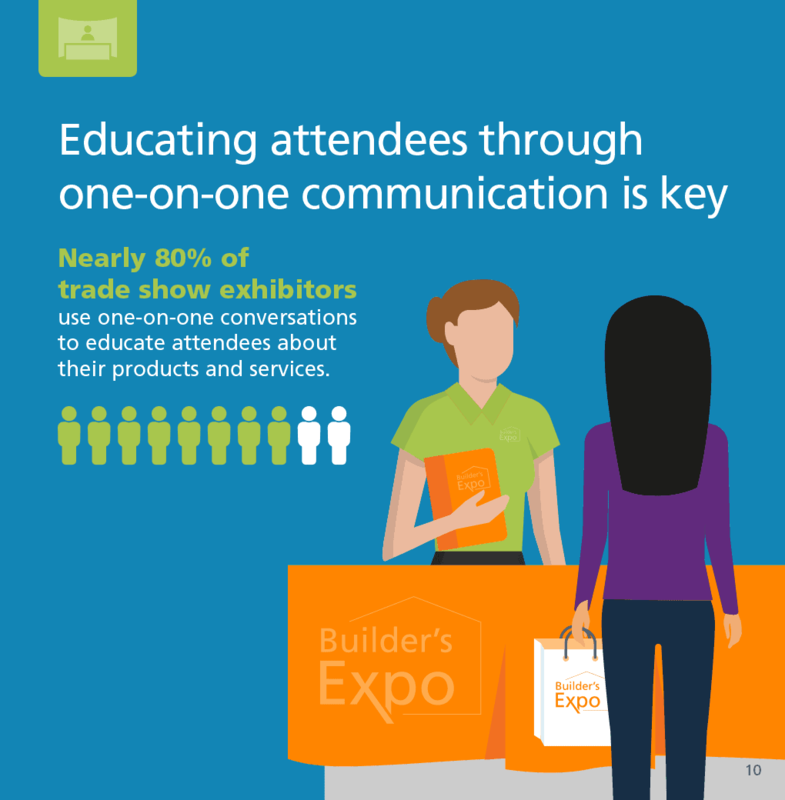 Nearly 80% of trade show exhibitors use one-on-one conversations to educate attendees about their products and services. 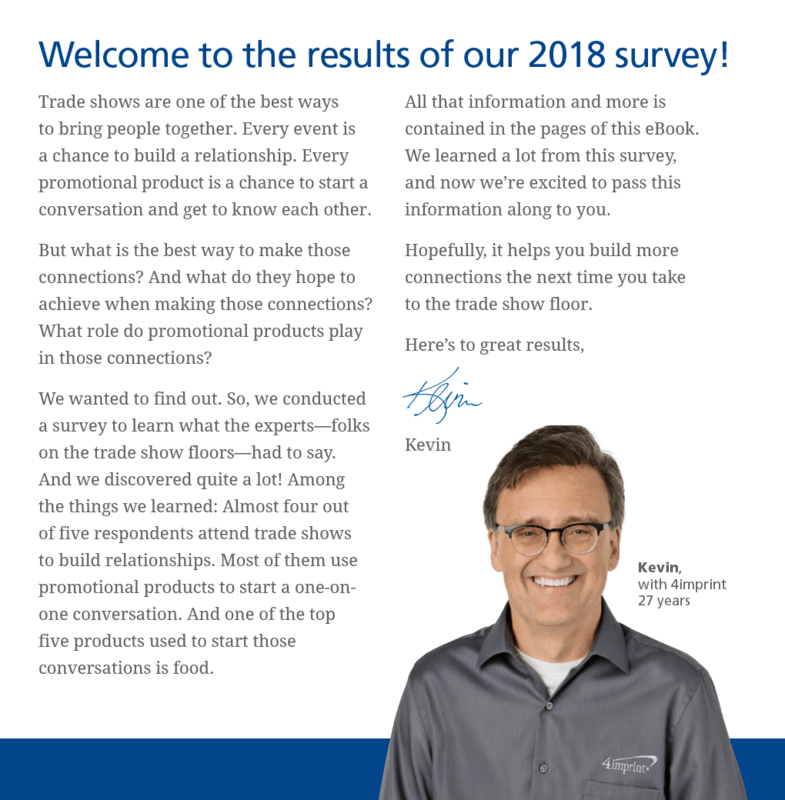 After one-on-one conversations, the survey shows product demos and informational literature are the next most popular educational tools when making sales at a trade show. 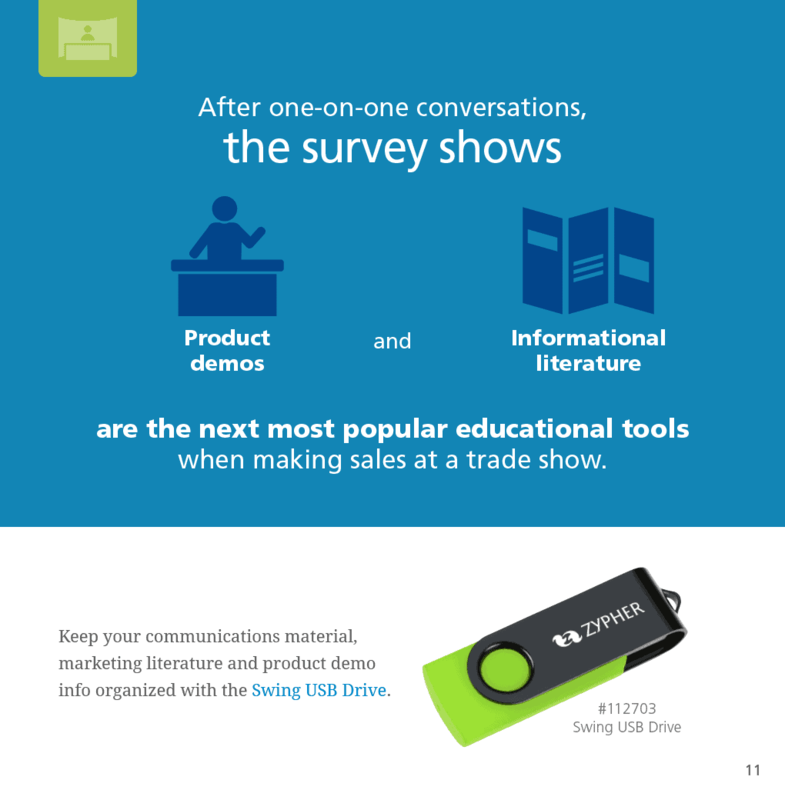 Keep your communications material, marketing literature and product demo info organized with the Swing USB Drive. Get them talking! 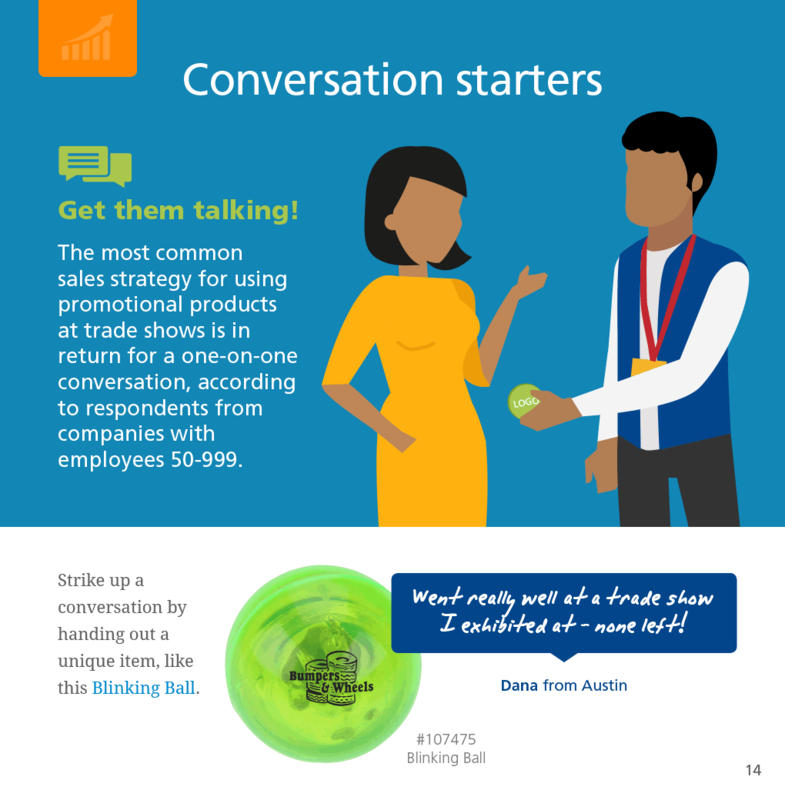 The most common sales strategy for using promotional products at trade shows is in return for a one-on-one conversation, according to respondents from companies with employees 50-999. Strike up a conversation by handing out a unique item, like this Blinking Ball. Training matters! 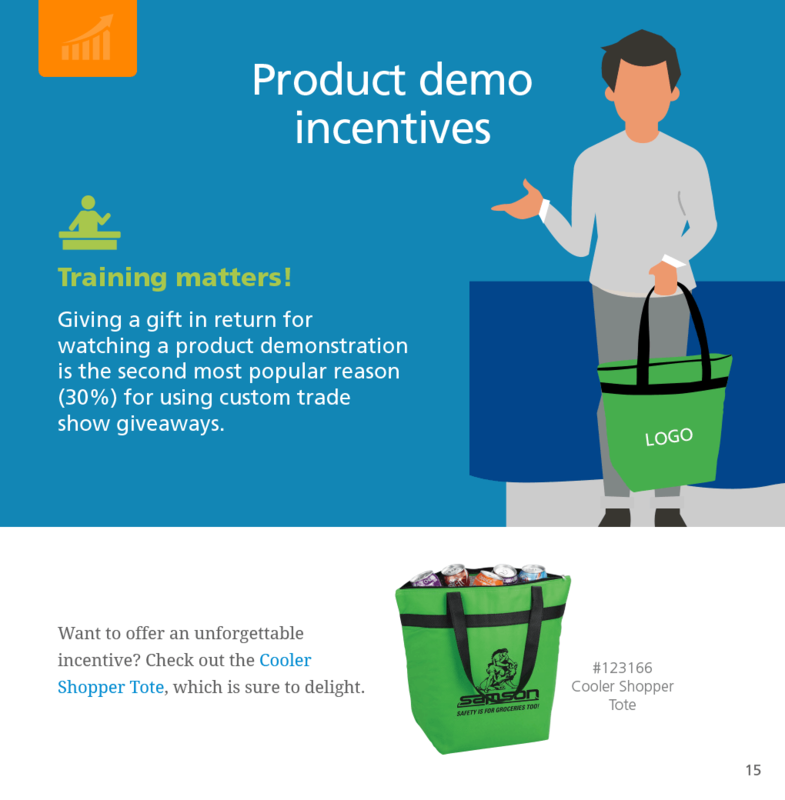 Giving a gift in return for watching a product demonstration is the second most popular reason (30%) for using custom trade show giveaways. Want to offer an unforgettable incentive? Check out the Cooler Shopper Tote, which is sure to delight. follow ups. 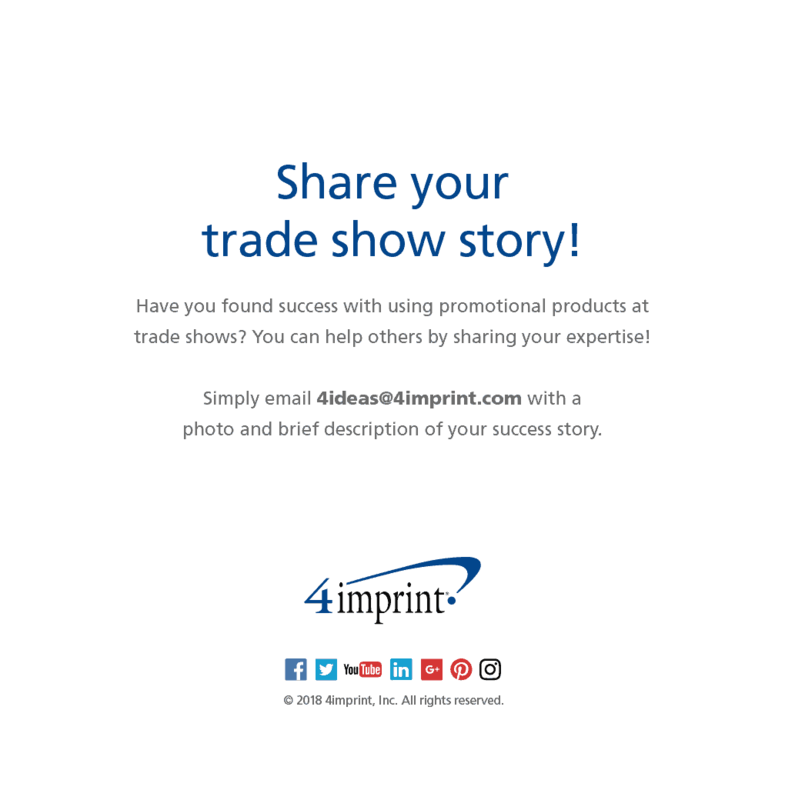 It’s a great way to further build your relationships and reinforce trade show connections. 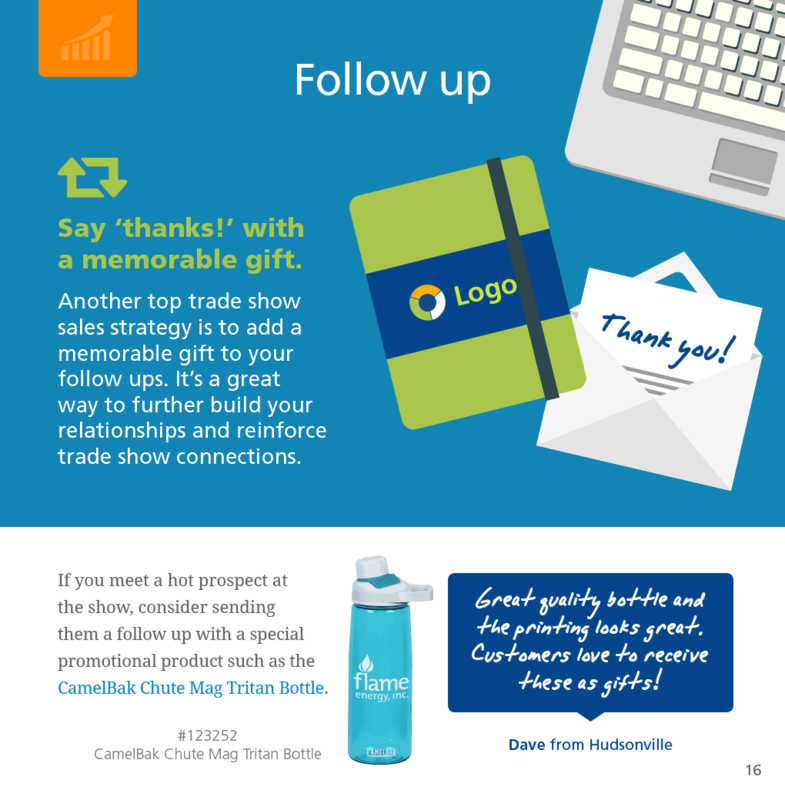 If you meet a hot prospect at the show, consider sending them a follow up with a special promotional product such as the CamelBak Chute Mag Tritan Bottle. Games can be an effective way to engage audiences. Check out the Micro Tabletop Prize Wheel with Case. 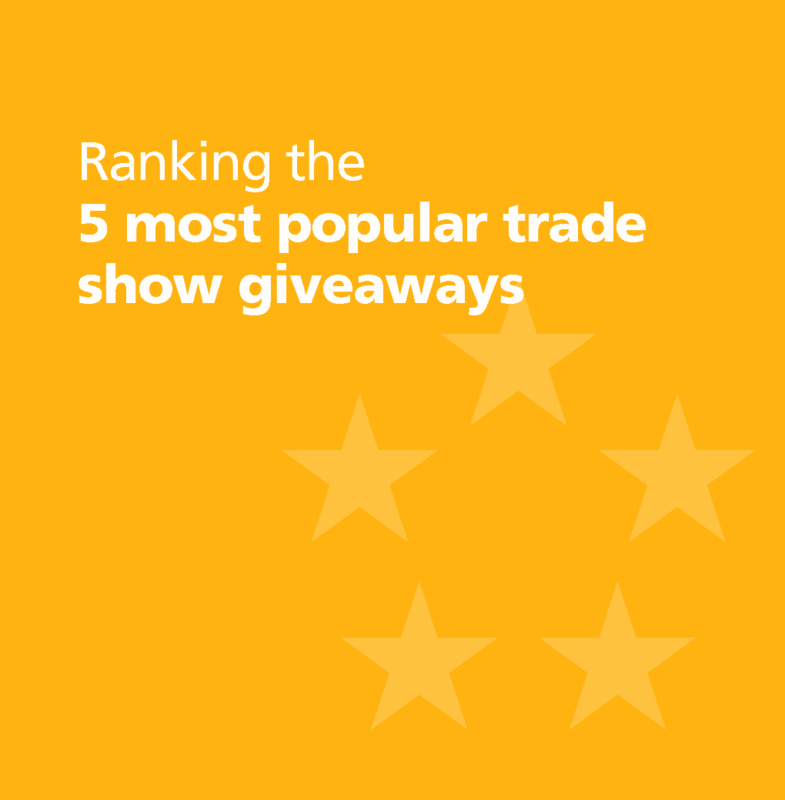 Here’s a look at the top 5 trade show giveaways, according to popularity with attendees. Power up your marketing! 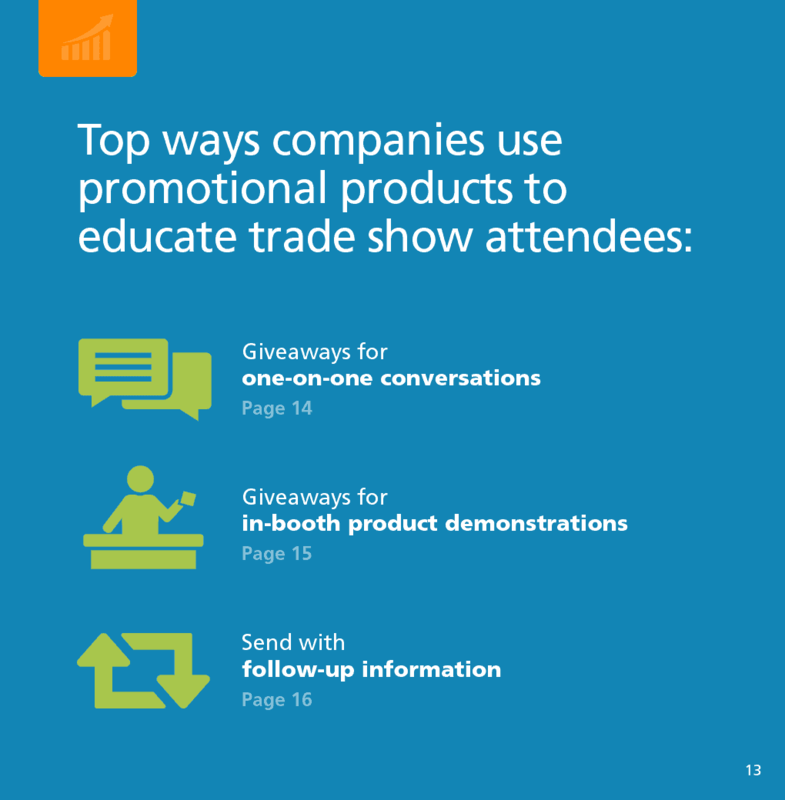 Tech products are by far the most popular promo product for trade shows. 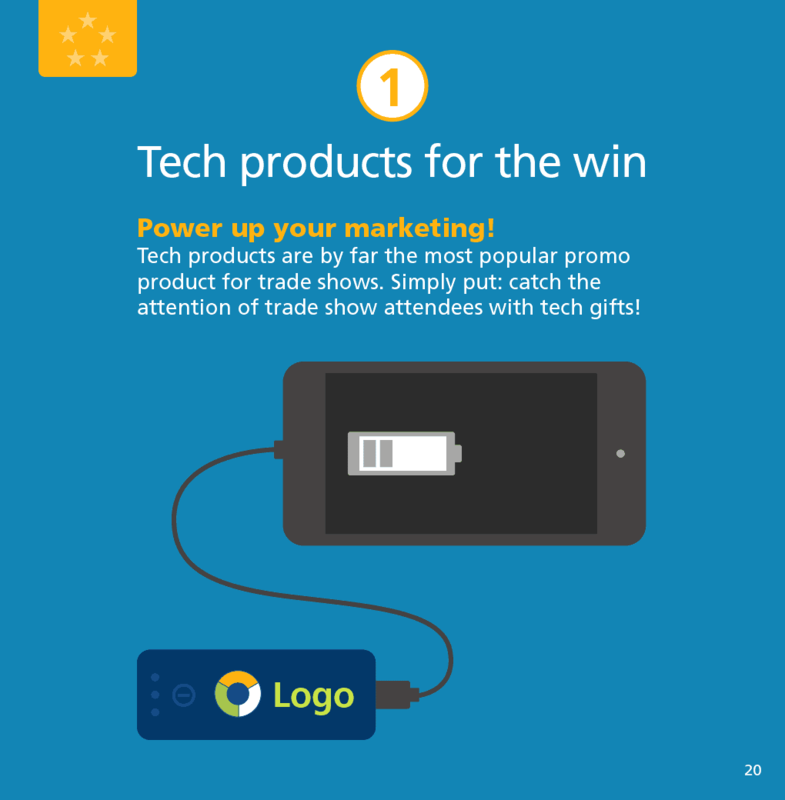 Simply put: catch the attention of trade show attendees with tech gifts! 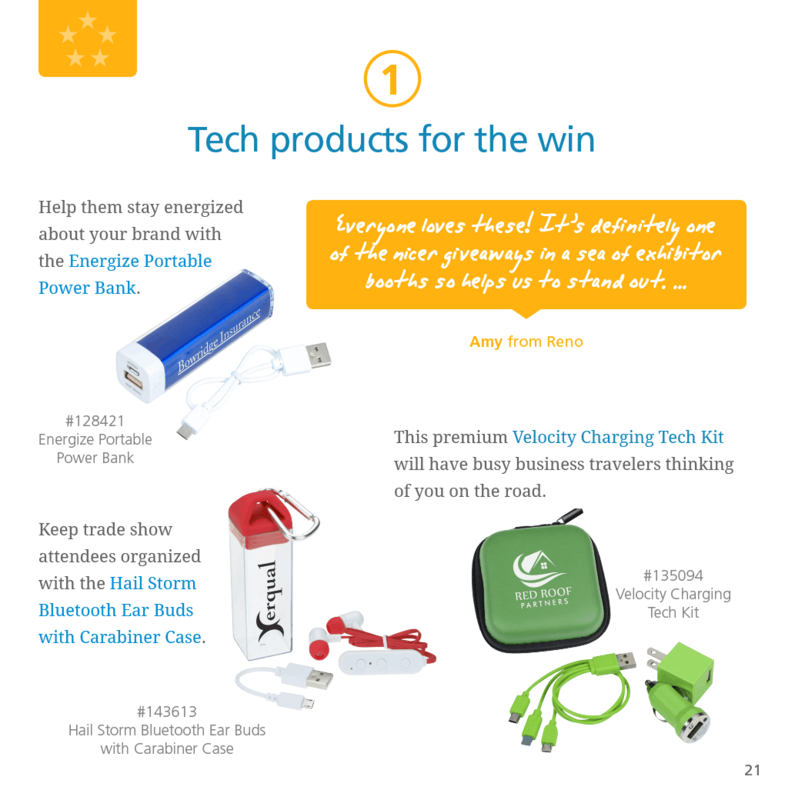 Help them stay energized about your brand with the Energize Portable Power Bank. Keep trade show attendees organized with the Hail Storm Bluetooth Ear Buds with Carabiner Case. This premium Velocity Charging Tech Kit will have busy business travelers thinking of you on the road. 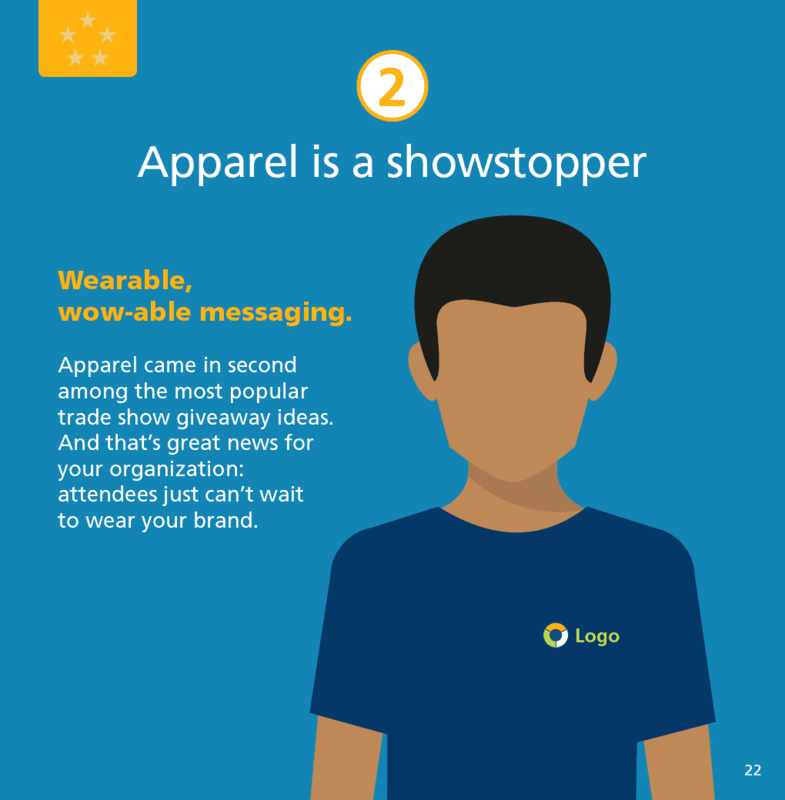 Wearable, wow-able messaging. 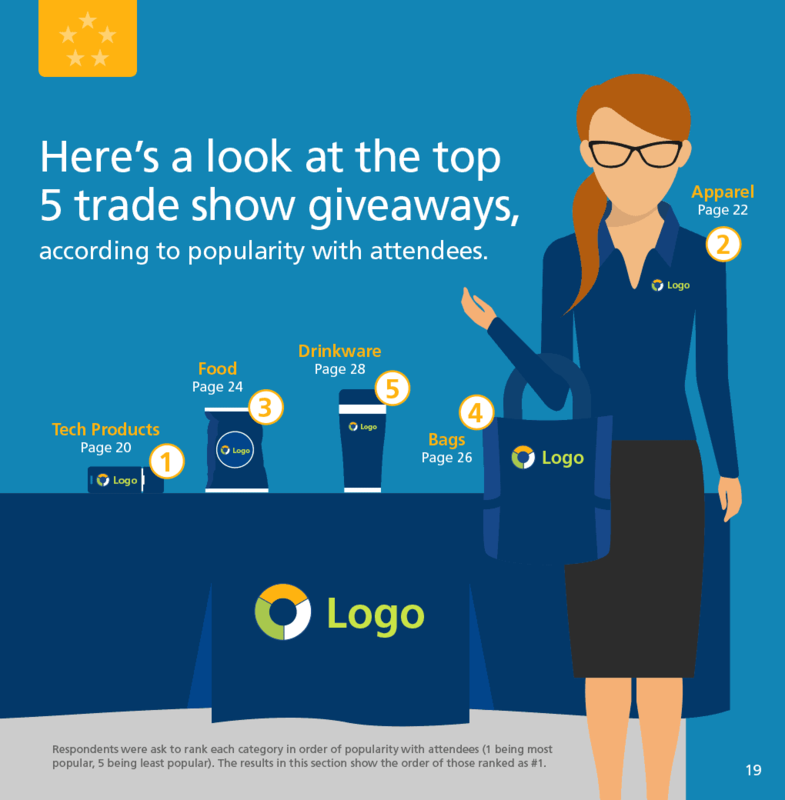 Apparel came in second among the most popular trade show giveaway ideas. 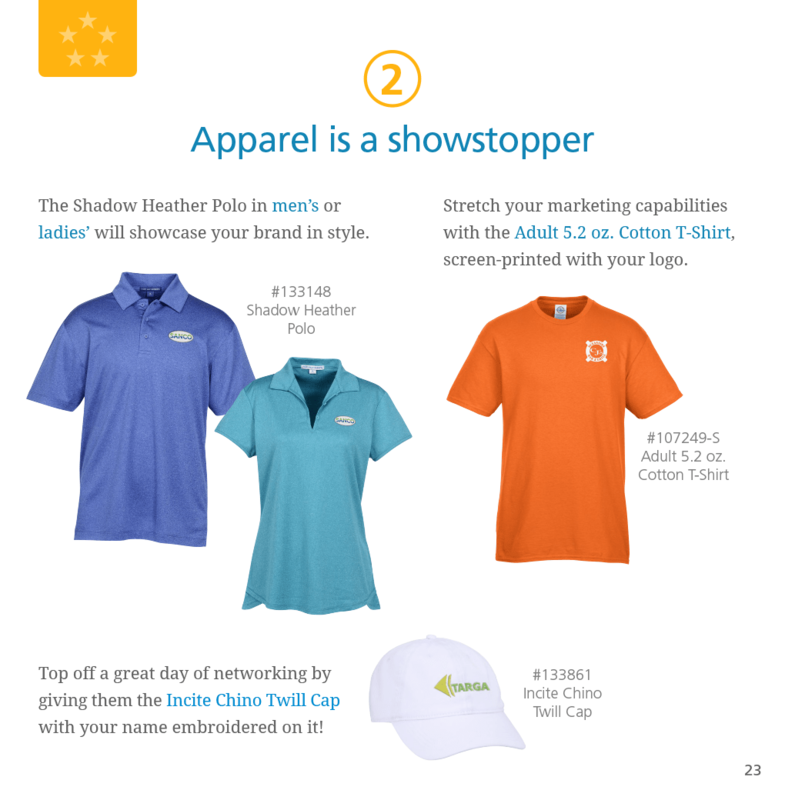 And that’s great news for your organization: attendees just can’t wait to wear your brand. The Shadow Heather Polo in men’s or ladies’ will showcase your brand in style. Stretch your marketing capabilities with the Adult 5.2 oz. Cotton T-Shirt, screen-printed with your logo. Top off a great day of networking by giving them the Incite Chino Twill Cap with your name embroidered on it! Sweeten leads with the Resealable Kraft Snack Pouch or these personalized Andes® Thins. 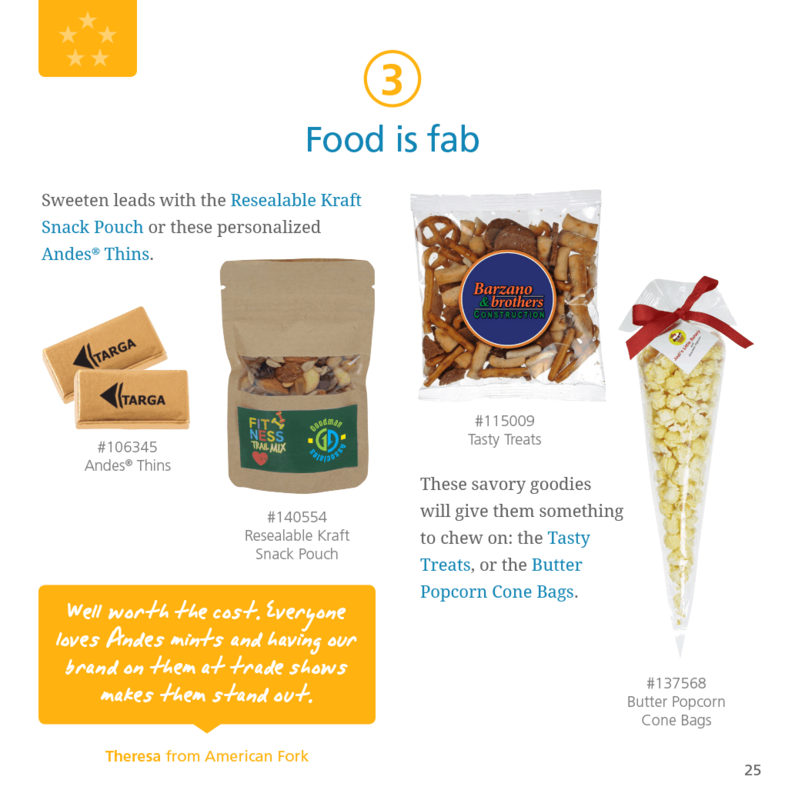 These savory goodies will give them something to chew on: the Tasty Treats, or the Butter Popcorn Cone Bags. Bags are big. 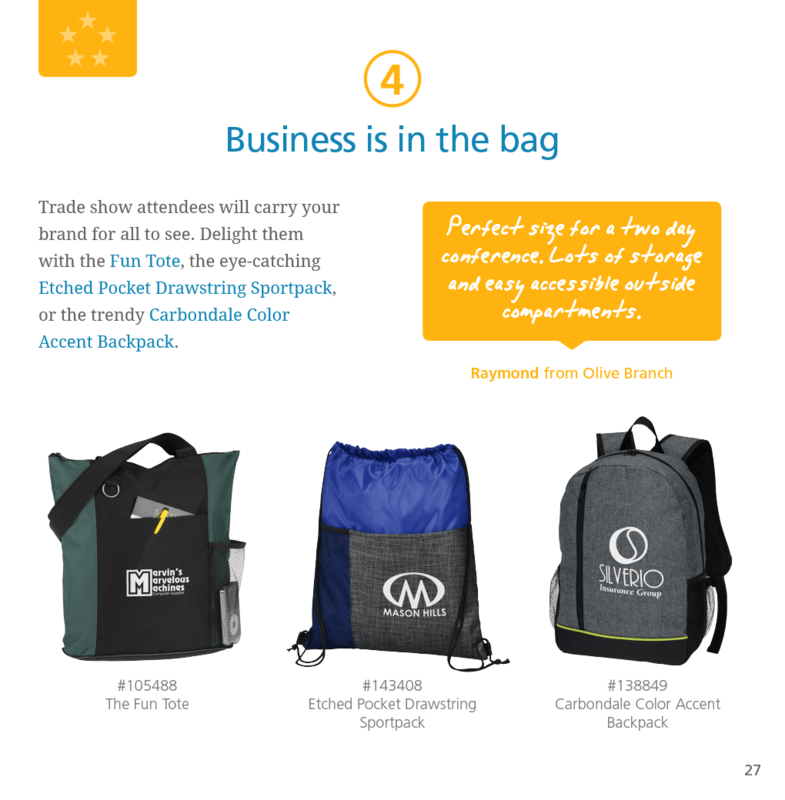 Think totes, backpacks, briefcases, duffels and more—bags came in fourth among trade show giveaway ideas. 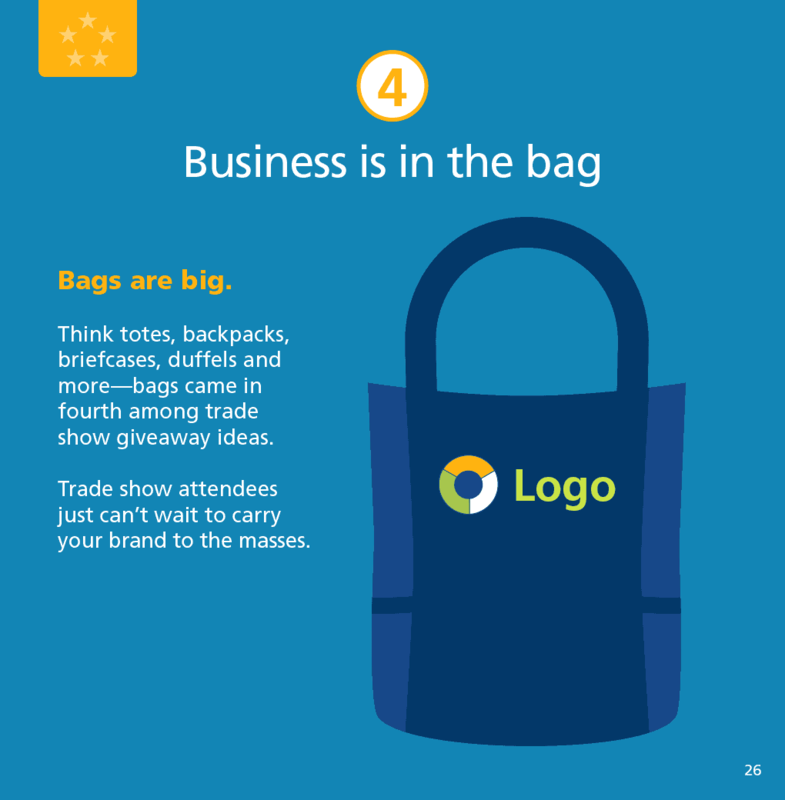 Trade show attendees just can’t wait to carry your brand to the masses. Etched Pocket Drawstring Sportpack, or the trendy Carbondale Color Accent Backpack. They’ll turn to the Lines Coffee Mug for their morning joe and your marketing message. 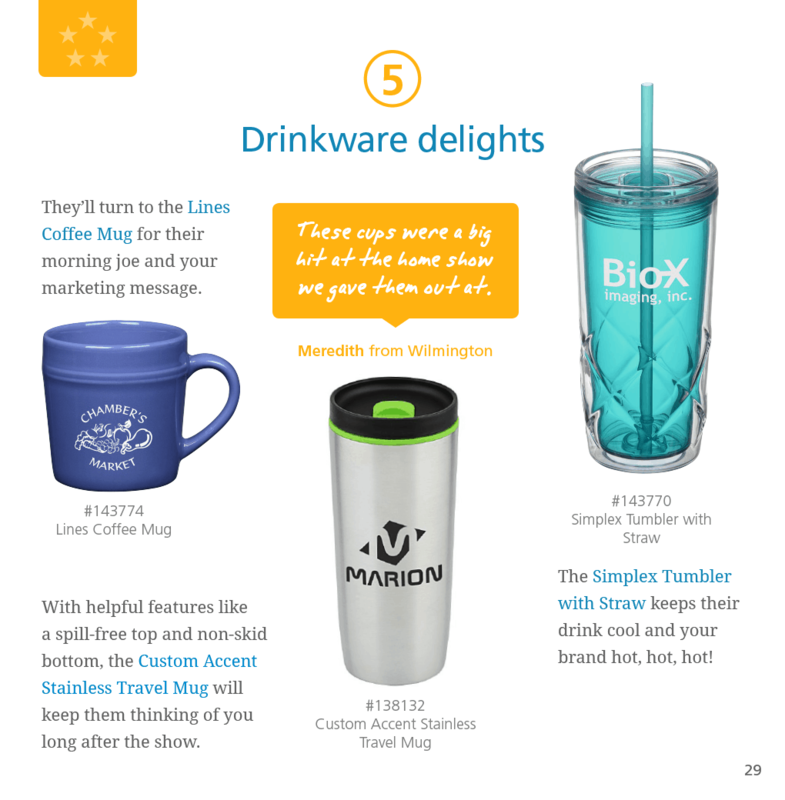 The Simplex Tumbler with Straw keeps their drink cool and your brand hot, hot, hot! keep them thinking of you long after the show. and you’ll energize your lead generation efforts. 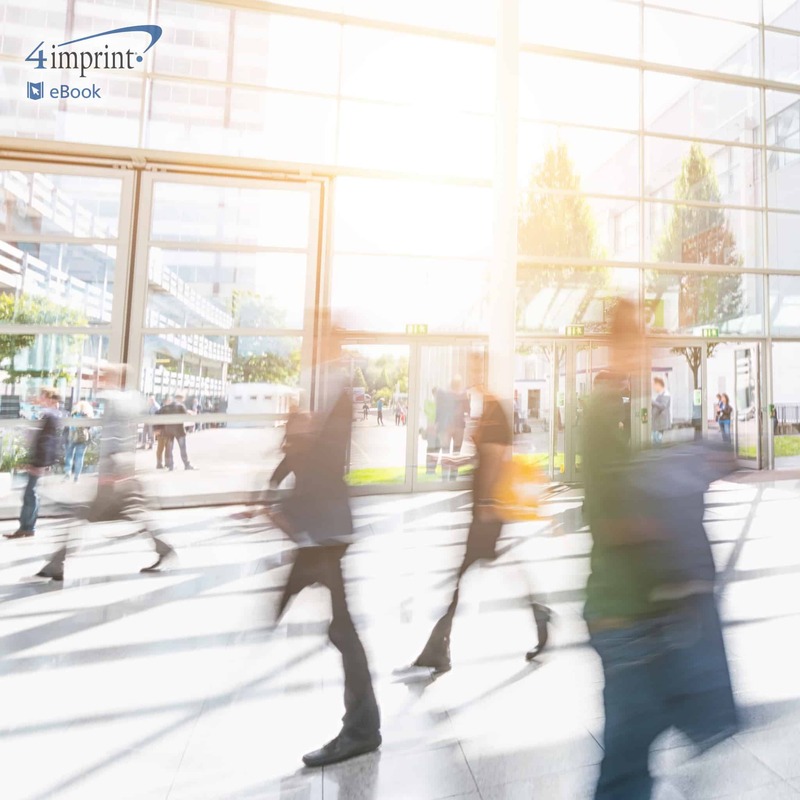 Trade shows are essential for building business relationships and making new connections. 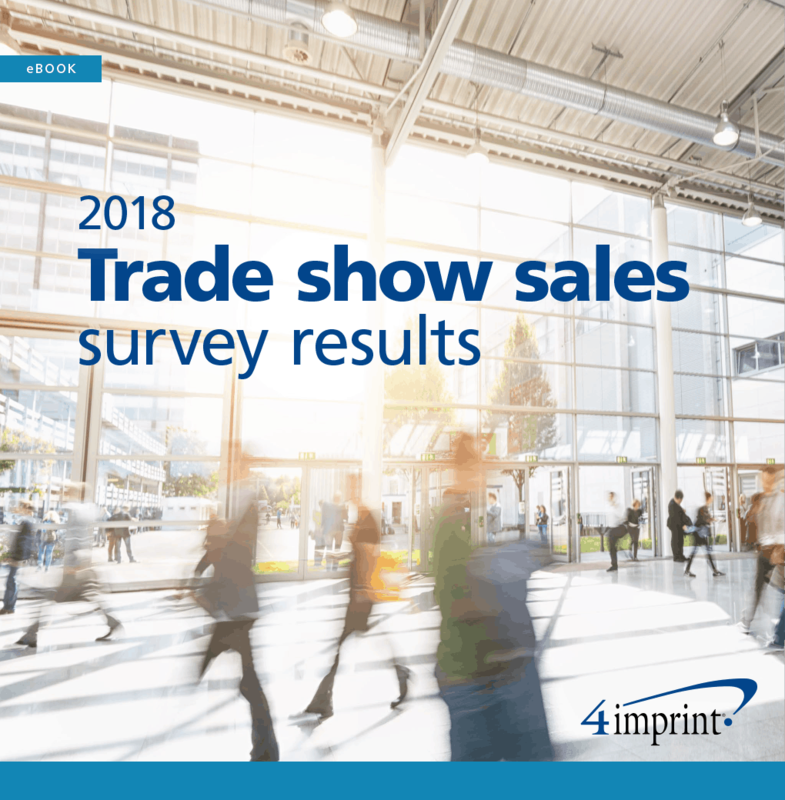 In this eBook, 4imprint shares results from a 2018 Trade Show Sales Survey showing how companies use trade shows to educate prospects, along with the trade show giveaway ideas that helped them.